We are coming up once more for a Fair in London – this one is at the Science Museum and it gives us an opportunity to see the amazing makeover of Exhibition Road that is now complete. In previous years we have had to struggle between roadworks and giant hoardings and general building chaos but now it all appears to be finished so even the approach to this Exhibition which displays Watercolours and Drawings and Works on Paper will be an excitement before rising up above the scientific exhibits in a glass and steel lift to Level 2. Here there is a magnificent display by numerous galleries who specialise in watercolours, drawings, original prints, photographs and then there is a group of those of us who produce artists books . . . how can you resist a trip out? 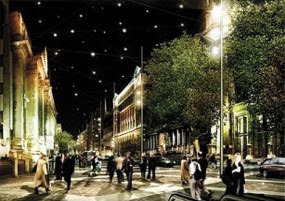 Click here for details of the new Exhibition Road project. There are details on the website of opening times, how to get there, who all the exhibitors are and news of the live music, café, champagne bar and all that goes to make a show with a considerable buzz. We can provide tickets for anyone who is interested in visiting if you email or telephone us. As always, it is a splendid opportunity to see and handle the books which otherwise you can only see on our website. However much information we put up there, nothing can compare with turning real pages of beautiful papers still fresh with the smell of inks as text and image flow before you. You don’t get original prints whether they be woodcuts, or engravings from copper plates on a Kindle or even in most books. We especially look forward to showing you our new titles – one by Natalie d’Arbeloff whose lively drawings leap from the pages of Stories from the Life of Jesus and our amazing versions of Powys Mather’s Procreant Hymn which include the copper engravings Eric Gill made for The Golden Cockerel Press and a second set which were previously unpublished with the text. All the engravings are freshly printed directly from Gill’s plates. I will be there, probably on the Saturday. Many thanks for the ticket and the mention, Frances. See you then.